“Thom Allison is fantastic as Captain Hook. He is as playfully evil as a DreamWorks villain, with a touch of Freddie Mercury swagger. Allison appears to revel in the boos emanating from the kids and adults in the audience, although he is also one of the funniest characters in the play. He had the crowd chuckling with the simplest of lines, including when he enters one scene saying “Hey, hey, hey!” with the attitude of a triple-snapping diva." Thom Allison said portraying Captain Hook has long been an item on his bucket list. He’ll get the chance starting next week in “Peter Pan: A Traditional British Panto” at the King’s Wharf Theatre. PENETANGUISHENE – Veteran actor Thom Allison wants to hear boos when he takes to the stage at the King’s Wharf Theatre on June 4. Allison said it’s a delight to play an “iconic” villain who ranks alongside Voldemort, Darth Vader and Hannibal Lecter in the all-time rogues’ gallery. Even better, this version of Hook shifts moment to moment, line to line, between markedly different personalities. 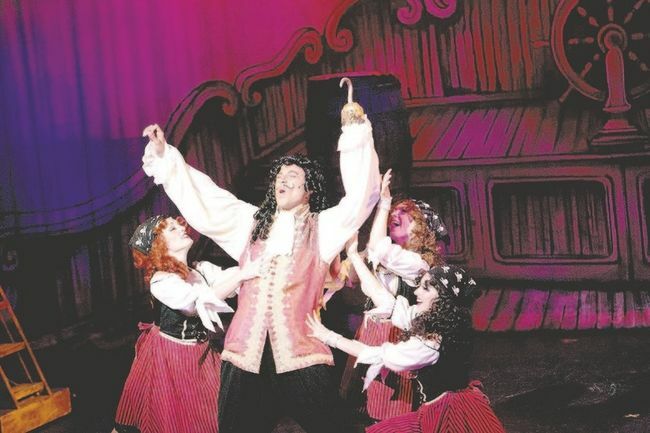 He said portraying Captain Hook has long been on his bucket list – “I’ve been wanting to get to him for ages” – but playing him in a pantomime only makes it sweeter.